Home / History of the Nisse. Nisse ( pronounced Nisser) have been living in Denmark since the world was young. In 1200AD a statue 15cms high was discovered in Norway, carved on the pedestal were the words ‘Nisse, Riktig Storrelse’ which means gnome actual height. Nisse can grow to 2ft tall but most are smaller. There are different types of Nisse, some live in the woods, others gardens, barns or houses but all Nisse are self sufficient in the ways of the old country crafts. 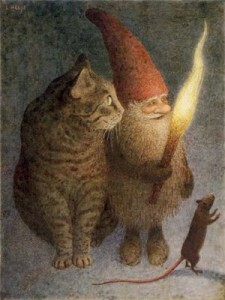 Nisse are close to their families and may move house with them while Tomte are more connected to the place they live. Swedish – Tomte or Nisse (a Vatte lives under the house wearing all black with a black beard).